George Reynolds is arguably the most prolific of all nineteenth-century English novelists, reaching an enormous audience through his thirty-six novels. Often selling in very large numbers in weekly one-penny installments, his works were known as by the most popular English novelist ever. Yet today, he remains almost unknown in the canon of English Literature. A serious radical, strongly pro-woman, and a leading Chartist seeking the vote for all men, Reynolds’ vigorous heroines differ notably from the Victorian novelists’ timid norm. He was strongly pro-Jewish and pro-Gypsy, very interested in French and Italian society, but wrote for ordinary English working people. Dickens thought him a dangerous leftist: for all these reasons, he was excluded from the elite literary world. 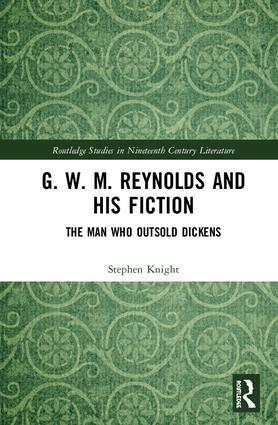 G. W. M. Reynolds: The Man Who Outsold Dickens reestablishes Reynolds as a major figure of mid-nineteenth-century fiction and an author of European range and status. This book examines his massive popularity and notable concern with the problems of ordinary people, especially women, in the complex and often dangerous new world of the modern city. With the support of his wife Susannah, Reynolds’ enormous influence would also make a contribution to the cause of mass political education through his role in the development of popular fiction and journalism. This book is a major innovation in the field of Victorian literary studies, with relevance to popular cultural studies, the politics of literature, and publishing history, presenting properly a much overlooked major English novelist. Stephen Knight (M.A., Oxford, Ph.D. Sydney, both in English Literature) taught at universities in Sydney, Canberra, Melbourne, Leicester, and Cardiff, and is an honorary professor at Melbourne. He has written many articles and reviews, and this is his twentieth book: they include several on crime fiction, the prize-winning Robin Hood: A Mythic Biography (2003) and recently The Politics of Myth (2015); The Mysteries of the Cities (2012) has a chapter on Reynolds’ The Mysteries of London.